John Mack, a prepper and former soldier, struggles to save his family and community after an EMP (electromagnetic pulse) takes out the country’s electrical grid. With most electronics, communications and transportation destroyed in a matter of seconds, the nation quickly collapses into anarchy. For John and the other residents of Willow Creek Drive, the breakdown of social order throws them back to the 1800s. As the community tries to come together, a powerful outside force appears that threatens their survival. Will John’s years of military and prepping experience be enough to keep them safe? 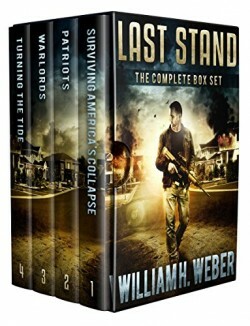 Mixing tons of useful prepping tips into an action-packed story, Last Stand: Surviving America’s Collapse is a must-read for any fans of survival fiction.